Ten Speed Press, 9781607745884, 272pp. 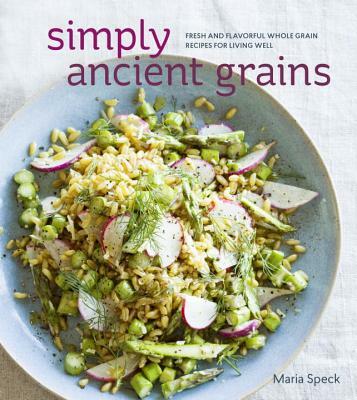 The award-winning author of Ancient Grains for Modern Meals, Maria Speck makes cooking with ancient grains faster, more intuitive, and easier than ever before in this collection of recipes, most of which are gluten-free. From black rice to red quinoa to golden Kamut berries, ancient grains are showing up on restaurant menus and store shelves in abundance. Yet in home kitchens, many fear that whole grains are too difficult and time-consuming to prepare. In Simply Ancient Grains, Maria makes cooking with these fascinating and nourishing staples easy and accessible with sumptuous recipes for breakfast, lunch, dinner, and dessert. Her family-friendly dishes are Mediterranean-inspired and delicious, such as Spicy Honey and Habanero Shrimp with Cherry Couscous; Farro Salad with Roasted Eggplant, Caramelized Onion, and Pine Nuts; and Red Rice Shakshuka with Feta Cheese. Maria’s tips and simplified approach take whole grain cooking to the next level by amplifying the flavor and enduring beauty of these nutritious grains. "Speck simplifies cooking with grains without sacrificing flavor. Her recipes—including minted barley and fennel stew with marinated feta, New England cider mussels with fresh cranberries and bulgur, and walnut spelt biscotti with olive oil—are deliciously nourishing and not to be missed."